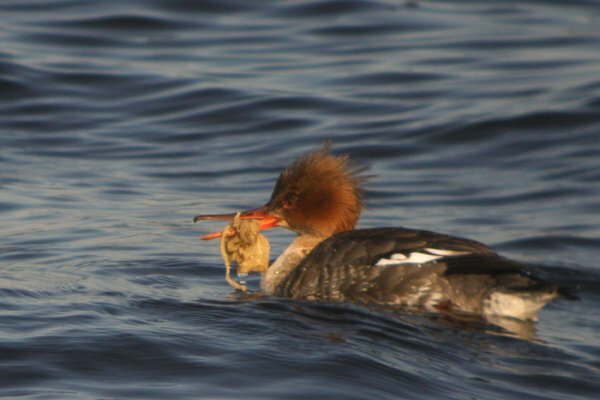 On a visit yesterday after work to Floyd Bennett Field in Brooklyn I happened across this female Red-breasted Merganser that I initially thought was in the midst of struggling to swallow a nasty chunk of some kind of marine life. It quickly became apparent, however, that the bird was having a hard time getting her snack to go down the gullet. In fact, the snack appeared to have gotten somehow stuck to or tangled around the bird’s bill. Then I started to wonder if what I initially thought was a snack was in fact some kind of human-artifact like string or plastic. No matter how long I looked in person or at my digiscoped shots I couldn’t (and can’t) figure out what the item is. 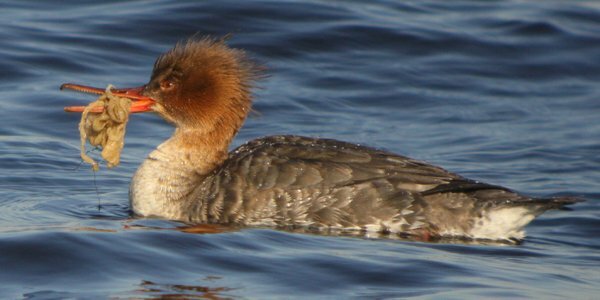 What do you think the merganser has gotten itself into? 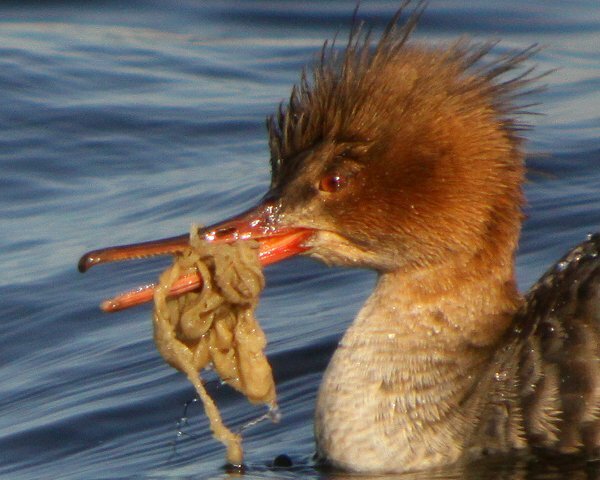 The bird seemed healthy, diving, flapping its wings and just acting like a merganser, so I imagine that the entanglement happened recently. Assuming the bird can’t get it off – and after spending fifteen minutes watching I left with the bird in the same situation – does it matter what it is that the bird tangled with in terms of if an attempt should be made to capture it and get it untangled? If it is, say, the innards of some kind of fish does that make it less of a priority to help the bird? Or should natural problems that birds get themselves into be as important in terms of rescue as human-caused ones? I’ve been wrestling with this idea in my mind since I spotted the bird and haven’t really come to a conclusion. What do you think? Anyway, the merganser tried shaking its head and using its foot to get whatever it is off its serrated bill and had no luck. Here’s hoping she ends up alright. But if anyone birding Brooklyn happens upon this bird and she looks like she isn’t doing well please try to track down a rehabber who capture her and help her out. My first thought was seaweed, but the more I look at it, the more I think it’s manmade. I still can’t put my finger on exactly what it is, though. The part over the bill and the dangling strand look kind of like yarn. I wonder if it could be a torn chunk of clothing/other knit item. @Cathy: I really couldn’t tell if it was fishing line or stringy organic material. Guys if anyone manages to catch this bird it should be brought to the Wild Bird Fund (http://wildbirdfund.com/) which is a NYC based wildlife rehabilitation center located in the Upper West Side. Unfortunately we are volunteer based and we don’t have the ability to go pick up or catch the bird. But we can offer it superb medical care. Half-rotten nylons? Poor bird, hope it gets rid of it soon. I suspect that it is a man-made fibre that has snagged on the toothed bill in the same way that a broken finger nail gets caught on a pullover. It doesn’t look like fishing line trailing from it, so hopefully she doesn’t have a hook in her mouth.